I was sent 3 of the SAX Cosmetics Quints to review, and I'm finally reviewing the last one - Media Darling. Again, I apologize for the quality of the swatches. I'm still trying to work out a good camera setting, angle and overall system for swatches. Bear with me! The first colour is a currant-purple colour infused with large flecks of glitter, the pigmentation is decent, and it is quite smooth. Not their best, but pretty good. The next is a gorgeous olive green colour with a golden undertone, quite similar to MAC's Sumptuous Olive. This eyeshadow is nice and smooth and buttery; by far the best colour in this quint. The third colour is my least favourite - a chalky dark matte purple. It's not very pigmented, and very difficult to blend properly. The fourth colour is a pretty pink, shimmery colour. 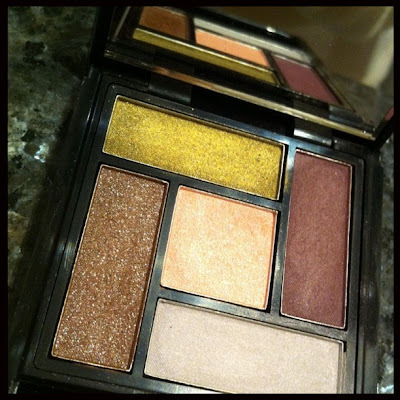 It works wonderfully as a highlight - and has a wonderful iridescence to it. I love it on the browbone. The final colour is a light lilac. This colour is easy to overlook - it looks plain and not very pigmented in the palette. But for those of you who love just a light wash of colour on the lids, this is definitely the colour for you. It blends out to this lovely, almost duochrome bluish purple colour, but only when it is very thinly applied. I first applied the lilac colour onto the lid. I applied this wet, to intensify the colour. Then, I applied the matte purple colour onto the crease. I blended the colour out, reapplied, and blended again. This was necessary because the colour isn't very pigmented, so it takes a few layers to really show. I then applied the glittery puple colour to my upper lashline, winging it out at the outer corners of my eyes. Then, I lined my eyes with the SAX Creme Precision Eyeliner in Black. Next, I took the olive green colour from the palette, and used it to smoke out the black on the lower lashline. Finally, I applied the light pink shimmery eyeshadow onto my brow bone. This colour is really very lovely. Nothing you can't get in other palettes, but beautiful nonetheless. I finished off the look with the Sleek Blush in Rose Gold and Lime Crime Lipstick in Coquette. All in all, I think this is a nice palette to have, if only for the olive-gold and highlight eyeshadow. For the price it retails for (AUD 14.95), I think the quality of this palette is pretty decent. It is not something I would recommend to seasoned makeup users, but definitely a wonderful beginner's palette, or something useful for people like me who love experimenting.